Selected newspaper articles: for full texts click on headlines. No one has heard before of Wu Bingyuan, a Chinese worker executed with a bullet in the back of his head during Mao Zedong's cultural revolution.... We know next to nothing about the ordinary victims, men and women who defended their ideals against the Maoist dogma. A pre-war Manchester Guardian correspondent who exposed the notorious Nanjing Massacre by Japan's occupation army in 1937 has become the target of Japanese historians seeking to prove that it never took place. Harold Timperley chronicled the massacre in his dispatches from Shanghai which were censored by Japanese officials, provoking a diplomatic protest. In China's Boxer Rebellion a century ago, 180 foreign missionaries were slaughtered. Here are the stories of two of Jesus's 'pioneers in skirts': one a victim of the massacre, another who managed to escape, thanks to her 'scandalous' marriage to a Chinese convert. "Beijing tries to bury its past"
My pass to the Chinese National Peoples' Congress has dumped me in a vast building site. It is the eastern side of Tiananmen Square, now cordoned off for convenient renovation in a year of sensitive anniversaries. Ahead through a cloud of dust rise the huge lotus columns of the Great Hall of the People, where the People - or 3,000 delegates of what counts as the Chinese parliament - are gathering to attend the NPC's opening session on Friday. "China recalls rural exile of a generation"
Small groups of middle-aged Beijingers have been visiting remote villages in northern China in recent weeks, bearing gifts for the peasants and reminiscences of a previous, much longer, stay. 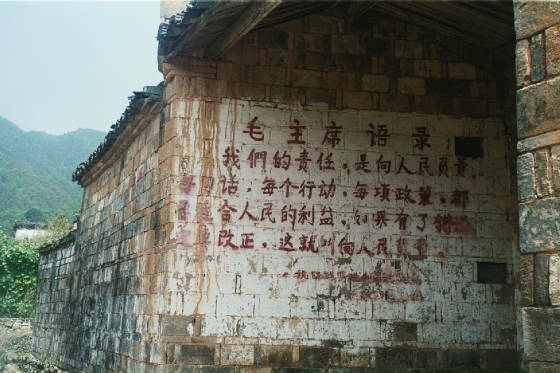 They are former 'educated youth' - a generation of students 'sent down' to the countryside by Mao Zedong 30 years ago.